On June 24, 1909, English mathematician William George Penney, Baron Penney , was born. He is acknowledged as having had a leading role in the development of Britain’s nuclear programme, a clandestine programme started in 1942 during World War II which produced the first British atomic bomb in 1952. William Penney was raised in Sheerness, Kent, and attended the local technical school in Colchester where he completed his technical studies. From early age, Penney displayed a talent for science and he began working as an assistant in a local science laboratory. Later on, Penney was admitted to the Imperial College Faculty of Natural Sciences where he was mainly educated in mathematics. After graduating, he was offered a research position at the London University, where he studied for a doctorate. William Penney was awarded the Ph.D. in mathematics in 1932 and then spent some time in the United States where he became foreign research associate at the University of Wisconsin–Madison. 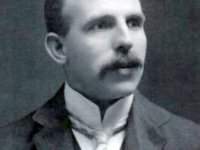 Back in England, Penney moved his interests from mathematics to physics and conducted a thorough research and theoretical investigation into the structure of metals and the magnetic properties of crystals. Penney was appointed Reader in Mathematics at Imperial College London, a post he held from 1936 to 1945. After the start of World War II, William Penney was offered a research position with the Royal Navy and he contributed significantly to the research of explosion events that created shock waves, and applications involving military use of hydrodynamics and gravitational waves. Penney also investigated problems connected with the properties of under-water blast waves from high explosives. Along with With Royal Navy engineer officers, Penney designed and supervised the development of the Mulberry harbors to be placed off the Normandy beaches during the D-Day invasion. These mobile breakwaters would protect the landing craft and troops from the Atlantic rollers. Penney then joined Tube Alloys the secret nuclear weapon directorate. Tube Alloys was a codename of the clandestine research and development programme, authorised by the Government of the United Kingdom with participation from Canada, aiming to develop nuclear weapons for the United Kingdom’s nuclear weapons program. 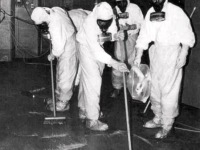 Tube Alloy started before the Manhattan Project in 1942 and at the end of World War II, the program came to refer specifically to the element plutonium, whose very existence was secret until its use in the atomic bombing of Nagasaki. Eventually, the program was subsumed to the US-led Manhattan Project. William Penney also joined the program at Los Alamos and for instance worked on the prediction of the damage effects from the blast wave of an atomic bomb. On 16 July 1945, Penney was an observer at the Trinity test detonation in Alamogordo, New Mexico. 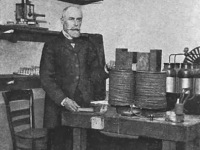 He was there to observe the effect of radiant heating in igniting structural materials, and had also designed apparatus to monitor the blast effect of the explosions. The Americans considered him to be among the five most distinguished British contributors to the work. After the war, the Atomic Energy Research Establishment (AERE) was established as the main centre for military and civilian atomic energy research and development in Britain and William Penney accepted the directorship position at the Armament Research Department in 1946. 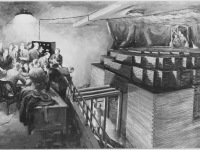 When President Truman made it clear that the UK would no longer be allowed access to United States’ atomic research, the British formed a secret committee, consisting of six civilian ministers of their government, charged with proceeding the efforts for Britain’s nuclear program. Prime Minister Clement Attlee‘s government decided that Britain required the atomic bomb to maintain its position in world politics. William Penney was then approached to lead the clandestine efforts. He quickly assembled a team to initiate the work on atomic weapons and in April 1950, an abandoned Second World War airfield, RAF Aldermaston in Berkshire was selected as the permanent home for Britain’s nuclear weapons program. 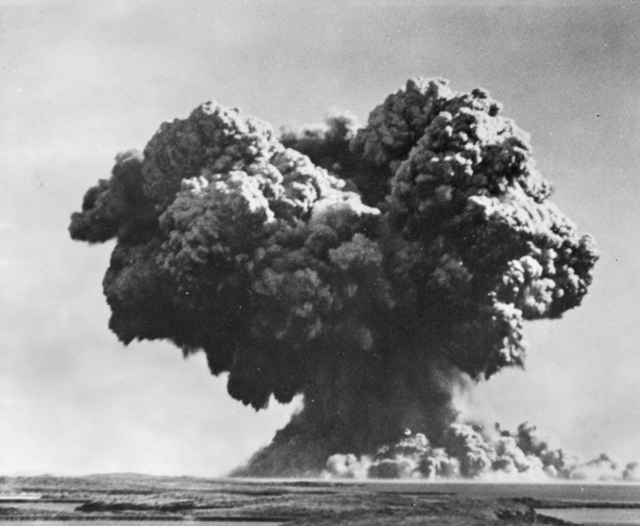 On 3 October 1952, under the code-name “Operation Hurricane”, the first British nuclear device was successfully detonated off the west coast of Australia in the Monte Bello Islands. Monte Bello Islands, WA, 1952-10-03. Britain’s first atomic weapon is detonated at 0800 hours. An early stage in the explosion after the initial orange flash had been enveloped by the great uprush of water. Immense clouds of smoke, steam and spray burst into the air. In the mid 1950s Britain felt the need to quickly develop megaton class weapons because it seemed that atmospheric testing could soon be outlawed by treaty. As a result, the UK wanted to demonstrate its ability to manufacture megaton class weapons by proof-testing them before any legal prohibitions were in place. According to an article in New Scientist, Prime Minister Harold Macmillan was also hoping to convince the US to change the McMahon Act, which prohibited sharing information even with the British, by demonstrating that the UK had the technology to make a thermonuclear weapon, and he put Penney in charge of developing this bomb. The Orange Herald bomb was developed and was passed off as a thermonuclear bomb, when in fact it was only a boosted fission weapon in which very little of the energy came from fusion. The test of this weapon was successful in convincing the Americans to allow information sharing with the British. From 1959 he was head of the Atomic Energy Research Establishment in Harwell as successor to John Cockcroft and thus also responsible for civil nuclear energy development. In 1957 he was chairman of a commission investigating the reactor accident at Windscale. In later years he admitted to qualms about his work but felt it was necessary. When aggressively questioned by the McClelland Royal Commission investigating the test programmes at Monte Bello and Maralinga in 1985, he acknowledged that at least one of the 12 tests probably had unsafe levels of fallout. William Penney died on March 3, 1991, at age 81. At yovisto academic video search, you can learn more about the Manhattan Project. The Penney Report (1947); Wikileaks.